This Gridwall Sign Holder Clips to the Top of Wire Display Panels! Double Sided Advertising Displays Attract Customers! 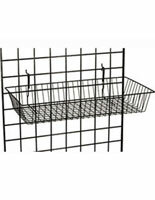 Order this Gridwall Sign Holder Online in Bulk with Wholesaler Pricing and Save! Top-load frame holds 11"x7" advertising signs. Metal clip attaches easily to wire rack panels. Customers will notice rack-mounted signage that is double sided for high visibility. This gridwall sign holder is made from aluminum with a black finish that will match grid wall wire panels. To install this signage frame simply clip it to the top of a wire rack. This top-loading accessory for retail displays, gridwall sign holder in black is designed to hold signs that are 11" and 7" tall. Double sided advertising will be highly visible in any environment. 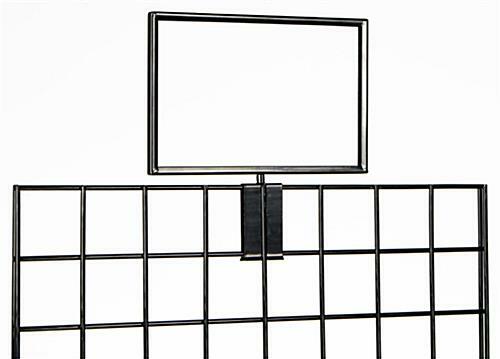 This gridwall sign holder, also known as an aluminum signage frame, can be used to alert customers to sales, new merchandise displays or specialty items. Changing signs in this clip on frame is very easy. To swap signage panels in this double-sided enclosure, gridwall sign holder, simply slide the old ad out the top and insert the new one. Because this frame is so easy to use, no tools are required for installing it on wire racks or swapping signs. 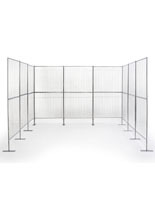 This gridwall sign holder, also known as an accessory for wire garment racks, is very inexpensive but can help increase sales in a retail or business environment. Customers browsing in a department or specialty store can see rack-mounted signage even at a distance. This top-loading wire rack accessory, gridwall sign holder, attaches securely to the top of any grid wall wire display panel with a simple clip.